Smart GIGASURF 50 With 1 Day Access To iWant TV Announced! Home / news / services / smart / Smart GIGASURF 50 With 1 Day Access To iWant TV Announced! 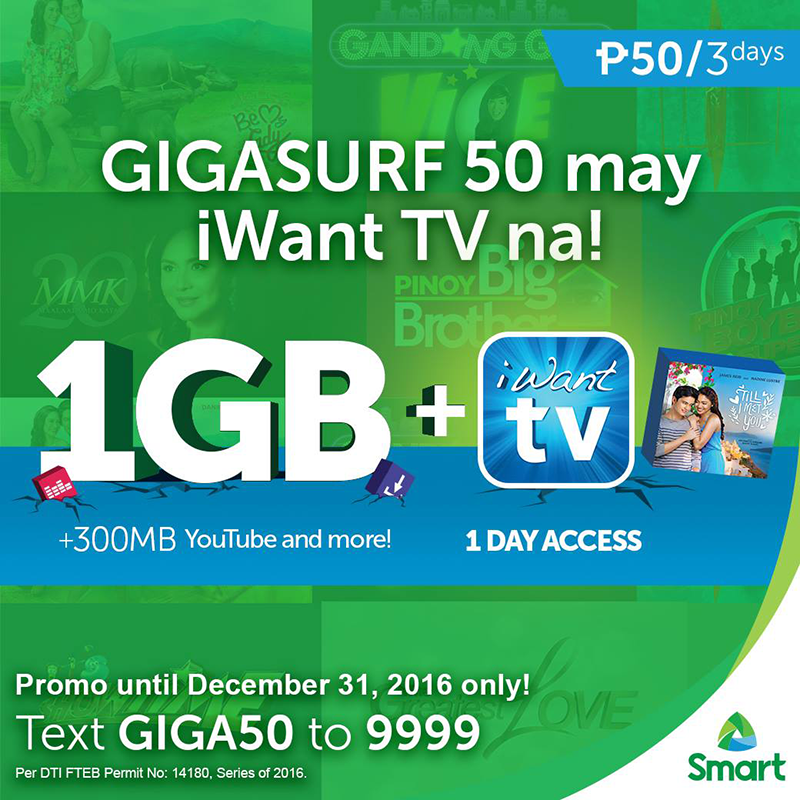 After the recent successful partnership of PLDT Home and Smart with ABS-CBN network for iWant TV, the companies has announced the new and improved GIGASURF 50 w/ iWantTV bundle! Aside from the regular GIGASURF 50 w/ 1 GB data allocation + 300 MB for YouTube and more for 3 days, you'll get a 1 Day Full Access subscription to iWant TV via voucher upon availing our Giga Surf promo. In case you missed it, using iWant TV lets subscribers stream past and current ABS-CBN shows such as On the Wings of Love”, “Dolce Amore”, “Ang Probinsyano” and “’Til I Met You”, as well as News and Current Affairs shows, among many others - anytime and anywhere. With the use of the new GIGASURF50 w/ iWant TV bundle, Smart subscribers can now enjoy watching those shows and digital contents anytime and anywhere. To register to this promo, all you need to do is text GIGA50 to 9999 and download iWant TV app on Android and iOS devices!